Saturday we had over 30 people come to our house to help assemble the donations for this month. We were so touched at all of the family, friends, and Mikayla’s Grace supporters who came to help assemble these donations. So many of the individuals who came to help out are fellow bereaved parents who are happy to help and do something in memory of their babies as well. We feel so fortunate to have met so many amazing people that are honored to help us carry out our mission to help these other families in our community. The mission of Mikayla’s Grace, and all that we have accomplished this year, would simply not be possible without the help of all these people. Here is a video from WKOW from that day. We put together 75 angel memory boxes and 60 NICU care packages which is our biggest donation yet. There were also around 70 gowns with matching hats and booties and 65 baby blankets donated as well. Something new we are doing this year is donating sibling teddy bears to St. Mary’s that will be given to siblings of the NICU babies. Often these children cannot visit the NICU so this gives them something to cuddle and play with while they wait for their baby sister or brother to come home, which for many of these babies can be several months. We also donated books especially for the NICU siblings as well. We were also fortunate to have some money left over from the Pepsi Refresh Project grant money to purchase several sets of The Zaky, a positioner specifically designed for NICU babies to help the baby feel like they are being held in their isolette and to help with their healing process. One addition to the Angel Memory boxes for this donation includes a brochure created by the Mother’s Milk Alliance. This organization is run locally in Madison and supports women who want to donate breast milk and those who need this precious breastmilk for their babies. 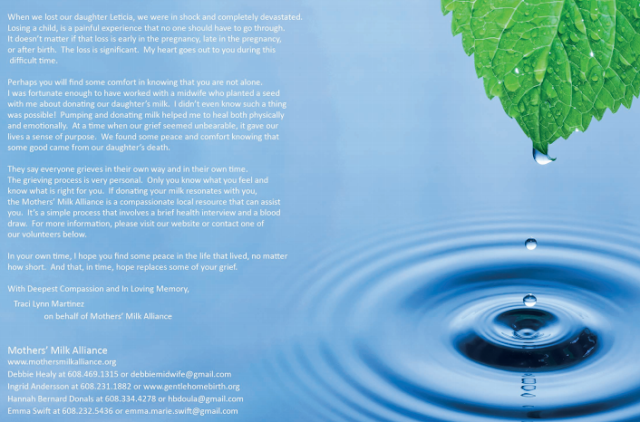 The pamphlet is geared specifically towards bereaved mothers who may wish to donate their breastmilk, and I think it’s such an important resource for families to have if they desire to do this. It was put together by a fellow babyloss momma, Traci, who donated her breast milk after the death of her daughter Leticia several years ago. We also added these tins for the lock of hair keepsakes for each memory box. We’ve always included keepsake cards with a small ziploc type envelope for the lock of hair but this allows parents to open the tin easier than the bags do. We still include both, so that parents can choose which they’d prefer or use both if baby has lots of hair. There were several local babyloss families that donated special items in memory of their angels. Dannah Kilborn donated 30 of these “Always remembered, always in our hearts” ornaments in memory of her daughter Emily. Jesse and Stefanie Spohn made these healing bracelets especially for other bereaved parents in memory of their son Jameson. We will be making the donation to St. Mary’s Hospital this Friday. It is our third donation to this hospital and over the course of the last 9 months we have managed to supply a year’s supply of these donations needed for the number of babies that need these services for memory boxes or NICU care packages to babies <30 weeks. We will be making our first donation to Meriter Hospital next Friday. They will receive 50 angel memory bags, which is almost a year supply for the number of infant losses seen at this hospital. Meriter already has very nice boxes, so we donate items that they do not include in their current memory boxes. These additional items include our pamphlets “What we wish someone would have told us before leaving the hospital: Advice from bereaved parents for spending last moments with your baby” and “Advice on making Burial or Cremation arrangements”, Strong and Tender Father’s grief booklet, Journal, Little Footprints Memory book, 3 D Casting kit for baby’s feet and hands, Baby Record keepsake, and our Resource envelope. Meriter will also be receiving 30 NICU care packages. Today we made our first donation to St. Mary’s hospital. 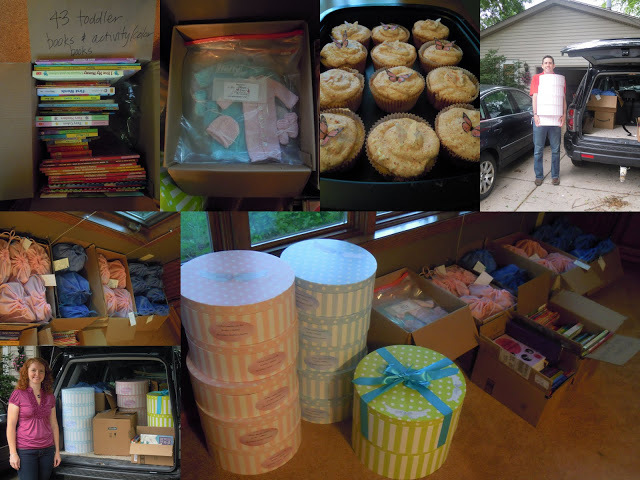 We donated 12 Angel memory boxes, 20 NICU care packages, 66 books, and 28 gowns with matching booties and hats!! And of course, to thank the amazing nurses who work at St. Mary’s we made them strawberry cupcakes. It just barely fit in the back of our car. We met Chantel Schneeberg, who is the bereavement coordinator at St. Mary’s and also one of our nurses, to deliver the items. Another nurse who has been instrumental in coordinating the NICU care packages, Laura Ziebarth, was there as well. We’ve spent the last couple of weeks tying up loose ends and getting the finishing touches on the project, so it’s been fun to see it all come together. We loaded up the carts and brought the donation items to the Family Care Suites. There were several nurses and other staff from St. Mary’s that were present to see the donation and hear about the items we were donating. We were able to share a little bit about our story and how Mikayla’s Grace got started. It was great to get feedback from them, and see their excitement for being able to give these items to the families. It felt good to finally drop the items off at the hospital, but the work is not done. Now, we start preparing for the next round of donations. Initially the NICU care packages are going to be given to NICU babies born before 29 weeks and there are ~40 of these babies admitted a year just at St. Mary’s! Our hope is that someday we will be able to provide care packages for all of those babies and even the babies born at later gestations as well. There are also many more families that experience the death of an infant at the hospital too. We’ll be working towards another donation of Angel Memory Boxes and NICU Care Packages for sometime this fall, hopefully near Mikayla’s due date, September 28, or Pregnancy and Infant Loss Remembrance Day, October 15th. We are so thankful to be able to give this gift to St. Mary’s hospital today, and to spread the love we have for our daughter Mikayla to others! We hope that these gifts will touch the lives of other parents in these stressful moments with their child. Thank you to the numerous people who have helped us start this organization and for all of the continued support with your donations! Our idea would be nothing without all of you who helped us fill these boxes with so many special items.